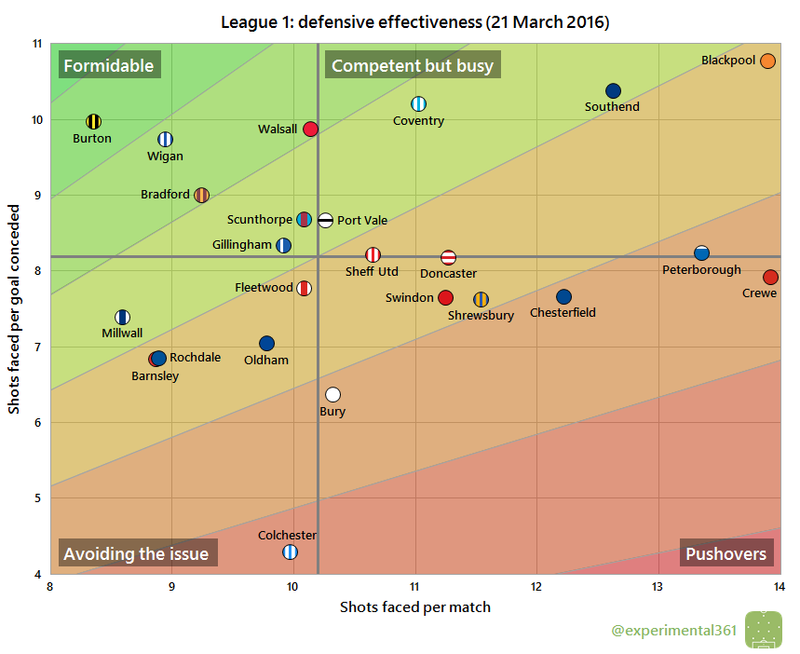 Ahead of the Easter weekend I thought it was a good time to update the scatter graphics for League 1, which compare the attacking and defensive performance of each club. These are explained here if you haven’t seen them before. First of all, here is how the number of shots taken by each club compares with those they face in return. The average number of shots taken per match is on the horizontal and the average number faced is on the vertical, so bottom right (take plenty, allow few in return) is good while top left (take few, allow plenty) is bad. The stripes are like contours: the greener the stripe, the better the performance (and vice versa for red). The top corners of the graphic are home to the division’s main outliers. Starting in the top left, Crewe have taken the fewest shots and allowed more than anyone else in return – marginally more than Blackpool – so their precarious position in the table is unsurprising. In the top right we have the ongoing entertainment of Peterborough, who are massively out-shooting the rest of the division but at the expense of allowing plenty of shots at their own goal. Leaders Burton are the most dominant side overall, allowing fewer shots than anyone else and with Coventry the only club other than Peterborough to have out-shot them. It remains impressive that Southend are in the top half – never mind in with a shot at the play-offs – based on how much they’ve been on the back foot this season. Two promotion-chasing sides – Gillingham and Millwall – have been by far the most clinical at converting their chances, despite taking a relatively average number of shots. Despite taking a very similar amount of shots, Doncaster have just slipped into the relegation zone thanks to some wasteful finishing. Along with fellow strugglers Blackpool they are the only clubs to have taken more than 10 shots for each goal scored. 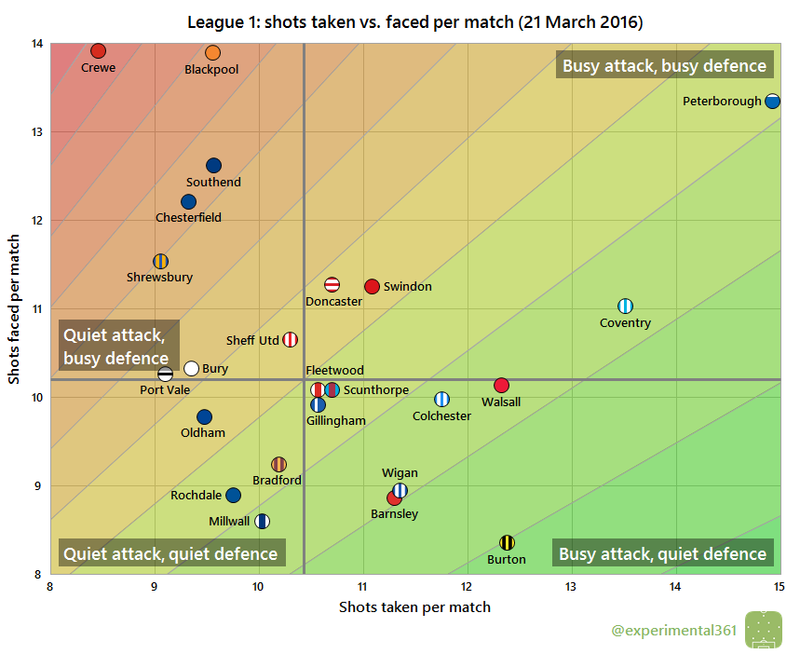 Interestingly the top and bottom side have eerily similar attacking records: both Burton and Colchester are among the five busiest shooters but have needed over a shot more than the average club to find the net. Burton‘s attack may not be the sharpest but not much gets past their defence. They are one of six resilient clubs spread across the top of this graphic, with Southend and Blackpool in the opposite corner even tougher to break down but allowing opponents far more opportunities to do so. At the bottom we can see the main reason for Colchester‘s struggles: their defence remains shockingly easy to breach. Withstanding around four shots for each goal conceded is almost historically bad – I’ll check at the end of the season but I can’t imagine that many sides have fared worse since records began. 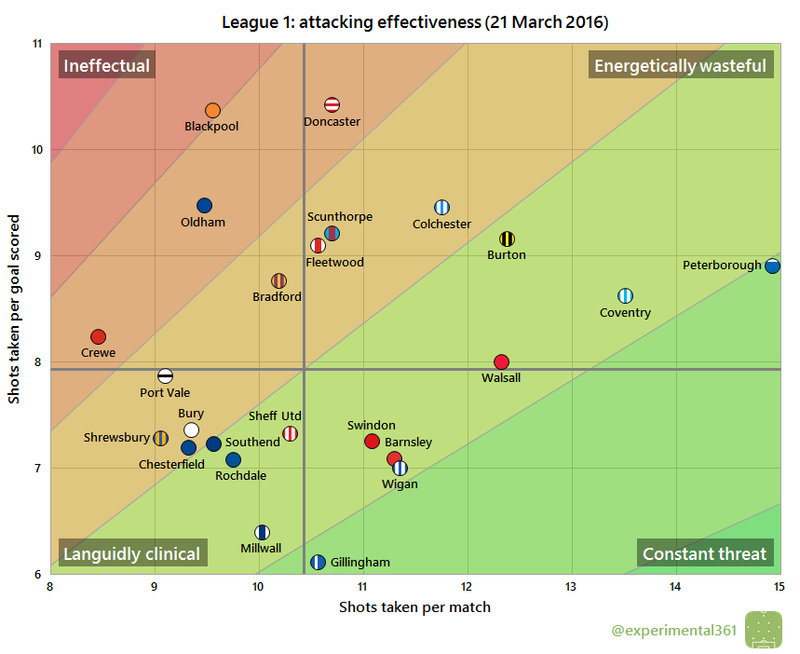 In the bottom right Burton remain the strongest all-round performers, although a cluster of sides are all performing well. Sheffield United continue to underachieve: despite operating the second most dangerous attack and looking decent at the back, they’re only in the top half on goal difference. The clinical finishing of Gillingham and Millwall is less of a mystery now: while they take relatively few shots, the ones they do get away are clearly of high average quality for them to be sitting in the bottom right here. 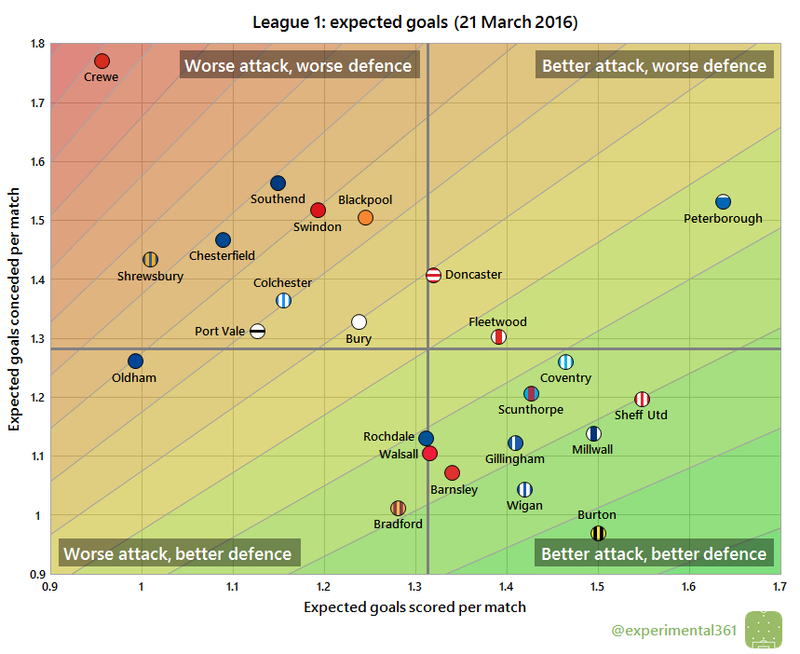 Blackpool look a lot less doomed when we correct for chance quality, but Crewe remain lodged in the extreme top left of the “bad quadrant” and it will take something special for them to pull away from the drop zone. Peterborough remain the most dangerous side going forward (at least when performances are averaged over the whole season) but are also a danger to themselves at the back.